The Coca-Cola Scholars Foundation provides college grants to 150 students a year. 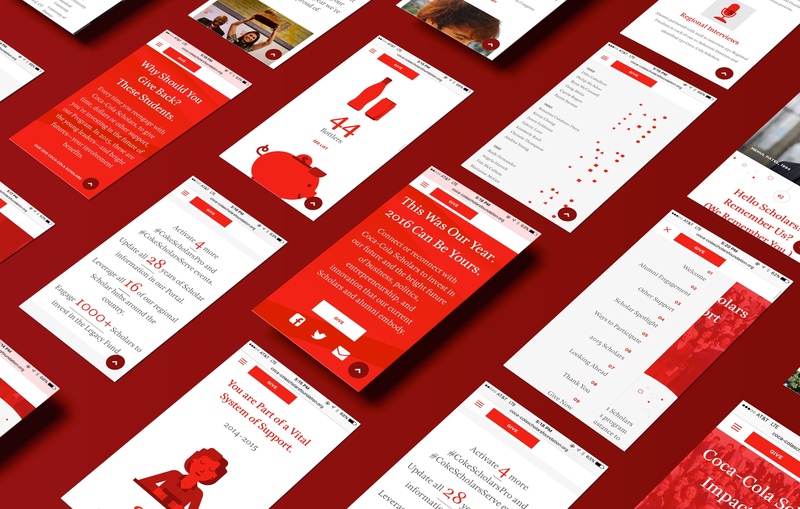 We designed a Responsive Website to showcase their end-of-year impact report. See It Here. The Coca-Cola Scholars Foundation (CCSF) grants life-changing funds to exceptional high school kids all over the U.S. so that they can take their post-secondary plans from big to utterly ginormous. These are the kids with two start-ups on their resumes before they graduate 11th grade. The ones that will, we're pretty sure, cure cancer. Coke Scholars supports them, and so far they've had 25 years of students graduate from their ranks. That's a lot of superheroes in the making. When Scholars connect, great stuff happens. Previous versions of the report had been printed booklets, but CCSF wanted something more dynamic and accessible this time around. 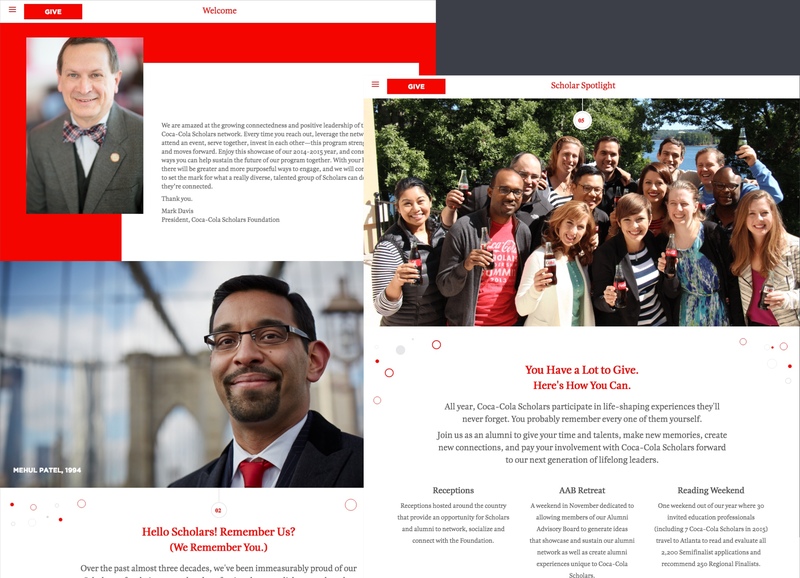 We suggested a microsite with the ability to pull a story, long-scroll style, out of the heaps of program statistics, feel-good student anecdotes, photos, videos, tributes, donation tallies, and other parts and pieces of their year. Viewing the information through the lens of an alumnus we saw this report as a chance to inspire a little nostalgia, and maybe even a little friendly competition. We paced the ask down the page, reminding Scholars that the organization remembered them, that they’re part of an ever-growing (and super impressive) family, and that they should remember us, too. We then showed them what their fellow graduates were giving back, how much their support matters, and then thanked them roundly. It made us feel pretty good, and we think it’ll help them feel inspired too. Easy to read, and update. Built in WordPress on a long-scroll template that branches off into deeper, list-view and gallery dives here and there, the site's back-end is easily updatable for the client (one of their biggest wishes). 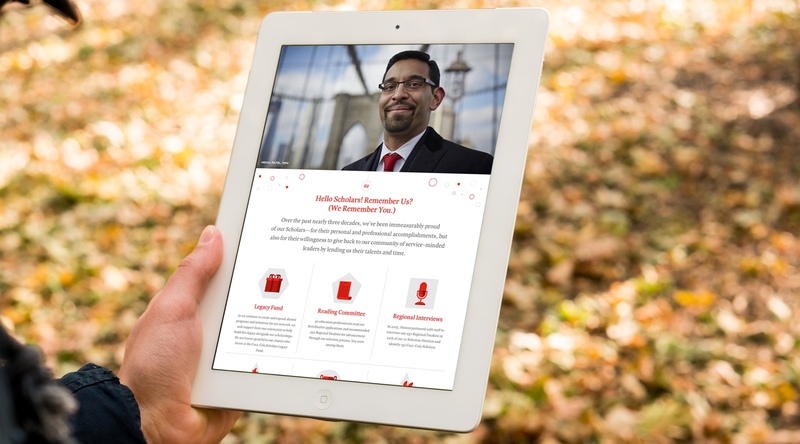 For implementation, we partnered with Float Left, a web developer focused on nonprofits. CCSF backed the dump truck of data and images up to our door, and we dug in with both hands. We read through hundreds of pages and organized everything into a narrative. Then we created wireframes and a template system, applied the design, and started filling in content. The developer and designer then sat next to each other (literally) to make sure our vision went live in the way that was intended. Now that's what we call teamwork.